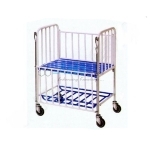 Jainco is a leading Hospital Baby Crib Manufacturer, Hospital Crib, Hospital Baby Crib Suppliers, Hospital Baby Crib India, Hospital Baby Crib Exporter, Hospital Baby Crib, Hospital Equipment India, Baby Crib. Jainco offer specially created, comfortable Baby Crib, that also are famed by names like child bed, cradle etc. 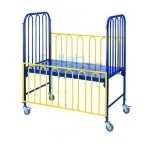 We offer baby crib for hospital use and also for personal home use. In our wide assortment, we provide stain less steel created baby crib and conjointly the standard wood created ones. 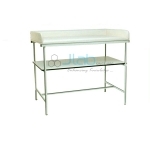 These area unit designed with excellent dimensions and posses optimum strength. These cribs area unit created extremely sturdy so one crib will be used for 3-4 years until once a child must be unbroken on the crib. 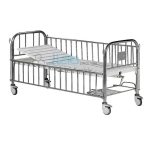 The hospital baby crib is intended otherwise from those that area unit for private use. Semi-Fowler Bed with mechanically operated Back rest by Super-Smooth crank mechanism. Infant Bed / Child Cot / Baby Bassinet, Size: 870mm L × 530mm W × 920-1070mm H.
Infant Bed / Cot, size: 810 × 460 × 960 mm. Completely made of Epoxy Coated Steel. Infant Bed / Cot. Height adjustable approx. 850 - 1000 mm.